Mushkin at CES demonstrated its new SSDs in 2.5”/7 mm form-factor aimed at mainstream PCs with a SATA interface. 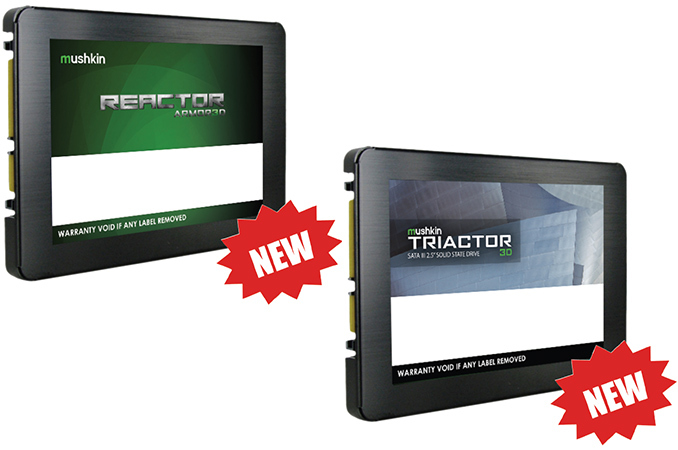 The new Reactor Armor 3D and Triactor 3D use 3D NAND flash memory, the same controller from Silicon Motion and offer nearly similar performance. The main difference is that the former use 3D MLC, whereas the latter uses 3D TLC memory. The NAND flash industry is transitioning to various 3D NAND architectures that enable higher densities, lower per-bit costs and higher endurance compared to planar flash made using very thin process technologies. So far it has not been easy for independent makers of drives to secure a supply of 3D NAND memory because some manufacturers are cutting down the share of produced flash they sell on the open market, whereas 3D NAND from others does not suit SSDs well. In the recent months ADATA was the only independent supplier of drives to offer 3D NAND-based drives, but as we observed at CES, the situation is about to change. Mushkin is another company to announce a lineup of SSDs featuring 3D NAND and targeting different market segments, from entry-level to the high-end. Unlike ADATA, Mushkin is announcing all of its 3D NAND SSDs at once, which implies that the company can get enough chips for different kinds of drives. Mushkin’s Reactor Armor 3D and Triactor 3D SSDs are based on Silicon Motion’s SM2258 controller, but while the former uses 3D MLC NAND, the latter uses 3D TLC NAND from an undisclosed manufacturer. The SM2258 controller has four NAND flash channels, LDPC ECC technology, a SATA interface, a DRAM buffer support as well as pseudo-SLC (pSLC) caching in order to maximize SSD performance. At present, the SM2258 is virtually the only market-ready third-party SSD controller with that supports 3D NAND (technically speaking, the SM2256 also supports 3D NAND, but drive makers prefer the more advanced controller so to address the higher end of the SSD spectrum), so Mushkin’ s choice is not surprising if the company needs rapid time-to-market (which is also why it does not wait for Phison's PS5008-E8). What is even more interesting is that Mushkin is considering to add 3D NAND-based drives to the Reactor lineup that uses the SM2246EN controller (this one is qualified for 3D MLC as well). It does not look like the company has made any final decisions, but it is considering such possibility in a bid to continue addressing the entry-level segment with the Reactor lineup. Mushkin does not disclose the name of its 3D NAND flash supplier, but we have a reason to believe that this is Micron. SanDisk and Toshiba are shipping their 64-layer BiCS NAND inside their removable media products and promise to use this memory for their SSDs. But as of now, 64-layer BiCS chips have not been qualified for SSDs. 3D NAND from SK Hynix is also available for various products, but it has not been qualified for SSDs just yet. 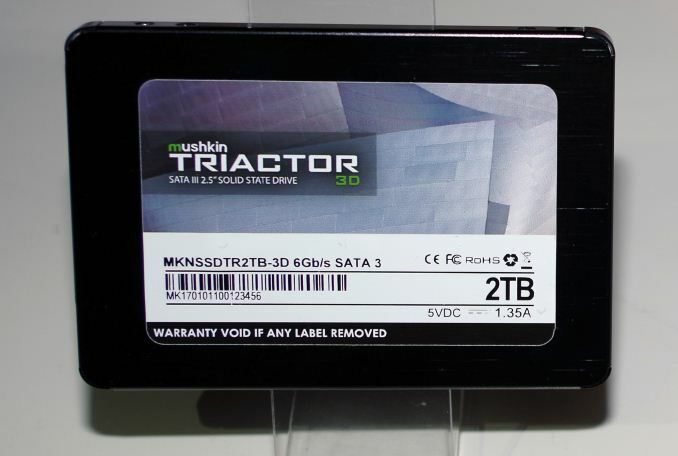 The Reactor Armor 3D SSDs will be available in 240 GB to 1920 GB configurations, whereas the Triactor 3D drives will feature 256 GB to 2 TB capacities. The former family will take advantage of MLC and offer slightly better endurance albeit at a higher price, whereas the latter lineup will be more aggressively priced thanks to cheaper memory. At the same time, it is noteworthy that both product lines include high-capacity (~ 2 TB) drives, an indicator that they target customers who need a lot of non-volatile memory and can pay for that. As for performance, Mushkin rates sequential read speed of both Reactor Armor 3D and Triactor 3D drives at 565 MB/s, whereas sequential write speed is rated at up to 525 MB/s and 520 MB/s (when pseudo-SLC caching is used) respectively. Random performance of the drives is specified at up to 90,000 read IOPS and up to 85,000 write IOPS. Mushkin did not announce MSRPs or ETAs for its new Reactor Armor 3D and Triactor 3D drives, but said that they will be covered by its three-year warranty. performance is something i don´t care about much anymore ... it´s basically a wash these days on SATA3. Yeah, it's funny how the performance just doesn't matter anymore for consumers. He has grown and matured over the years. any reasonably fast SATA SSD performs just as fast as any other one, even NVMe ones, because the bottlenecks have shifted elsewhere. How fast do you think these Munchkins can copy and paste to/from same drive on this machine?